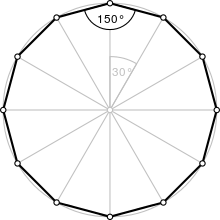 ^ Polygons – Dodecagon. coolmath.com. ^ 柯謝克（英语：József Kürschák）的幾何證明 Kürschák's Dodecagon. the Wolfram Demonstration Project. ^ "Doin' Da' Dodeca'". mathforum.org. [2017-06-08]. （原始内容存档于2016-09-17）. ^ Chavey, D. Tilings by Regular Polygons—II: A Catalog of Tilings. Computers & Mathematics with Applications. 1989, 17: 147–165. doi:10.1016/0898-1221(89)90156-9.